You can buy tippet rings about anywhere. They are very handy for tying droppers or for attaching your tippet to the end of your line. I use them for constructing my two or three part keiryu lines. 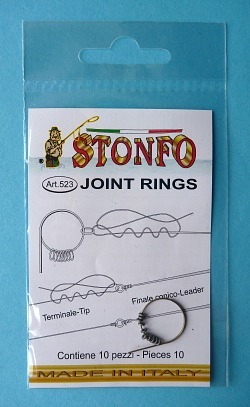 These come on a very handy split ring so you can easily tie your line or tippet to the tippet ring before removing the tippet ring from the split ring. That may not seem like a big deal but it makes it much, much easier to tie one onto your line or tippet. Try it once and you will become a believer. Standard shipping is via USPS First Class mail. A shipping/handling charge of $4 will be added to all orders. If you live outside the US, you must add more postage unless the items on this page are mailed with a rod! Please note: The buttons below only add the postage, they are not for the product AND the postage. You must click on the product button above also. TenkaraBum.com does not sell to residents of Norway or any other county of the European Union or the European Economic Area. Add this amount for shipping. No additional postage required for First Class mail. First Class should be just as fast for people living east of the Mississippi. Do Not click if your order includes a rod, wader gaiters, 3x5 Photo Tank or Daiwa Keiryu Damo. They already go via Priority Mail.